Branding materials for Blue Poblano, a Mexican-Navajo fusion restaurant in Downtown Salt Lake City, Utah. Work on this project began in early 2015, and has continued as the business grows and develops. The first objective was to create a responsive logo that would effectively adapt to a variety of applications. BLUE POBLANO LOGO: Two Color version of the Blue Poblano lock up. BLUE POBLANO LOGO: One color version of Blue Poblano logo lock up. BP MONOGRAM LOGO: A simple, readable logo suited for icons and other various uses. 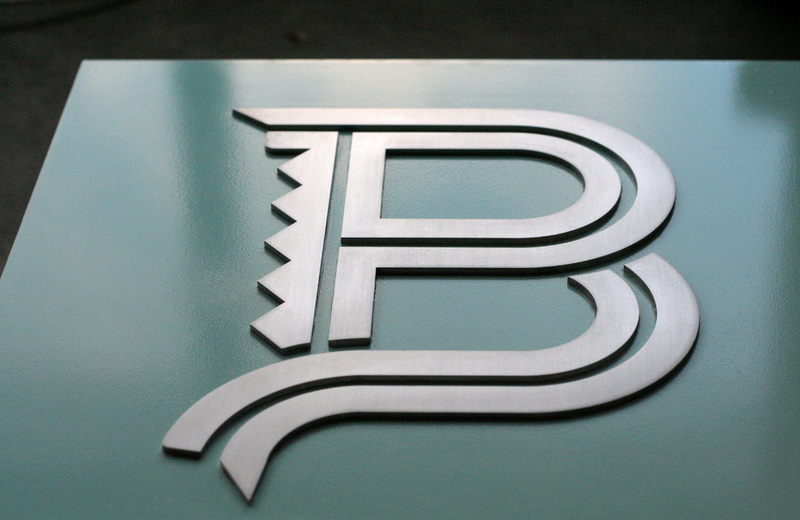 BLUE POBLANO SIGN: Custom cut, brushed metal sign, hand-painted using Blue Poblano's specific brand color. BLUE POBLANO MENU BOARDS: Hand cut, painted and screen printed boards for a striking, easily adaptable menu. Menu pages can be replaced, amended, and reprinted as necessary, at little cost to the client. We consider upkeep and durability very important when creating brand materials. BLUE POBLANO SHIRTS: Mockup provided to the client for employee or merchandise design.